A new display at the Catawba Science Center in Hickory, American Adventure, is a matter of life or death. The interactive experience casts museumgoers into the delicate fates of European colonists as they strive to survive in the early settlement of Jamestown. In reality, of the 104 settlers that arrived there in 1607, only 38 were able to withstand the first year. Exhibit visitors journey through a maze and must make hard choices that impact their health, wealth, morale, and sustenance, demonstrating the pioneers’ sometimes-fatal trial-and-error approach. 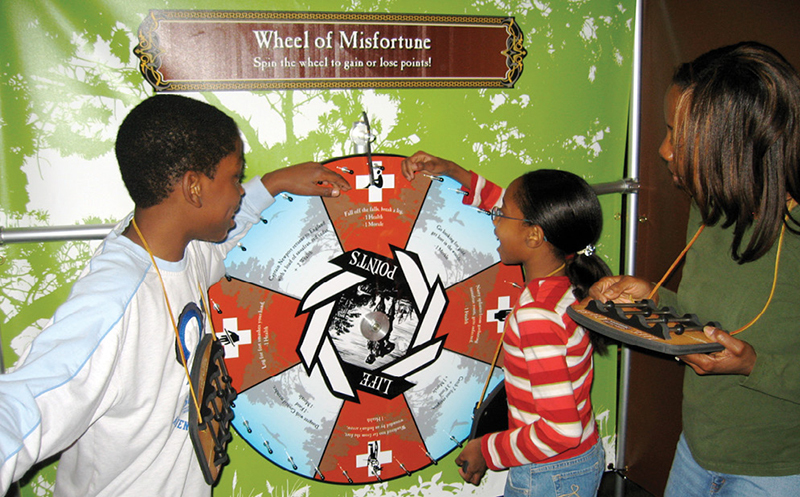 At the end of every season, participants spin the Wheel of Misfortune, which can grant another day of choices to make or cut the journey short, mirroring the random twists of fate experienced by the pilgrims. “Multiple guests have told us they feel like they’ve been transported back in time,” says Megan McLain, the center’s marketing and communications director. “I barely made it out.” If your character should perish, however, don’t despair—there are several opportunities throughout the exhibition to start anew.